Thats easy, made in China. I think it was John A who said these were great guitars for the price. This is by far the best Burny 335 I have ever played. The buidling quality is great, the hardware, the electronics and pickups are all Japanese. Do the chinese Chinese Burny come with VH1? This mystery is by far solved. Especiall since there were a Japan made series of Burny made in the early 2000 with serial numbers starting on 02. Doesn't Chinese Burny have letters in the beginning of the serial number? Or is that a mix as well? Chinese made Burny have this kind of serial : FG02XXXXXX for a 2002 made model. There are other manufacturers which are able to made these Burnys. Just let me find a picture of one japanese LP made model, Ebay seller Chingo have one 4 or 5 months ago. Do you really think that Burny was able to sell a chinese guitar at 100000 Yen in 2002 ? Apart from that the guitars seem to be "the same". As I?ve said before, mystifying it is. Koubayashi has a lot of experience with MIJ-guitars and he believes that this Burny RSA100 - with a sticker/serial starting with 021XXXX - is made by Tokai in Japan. He also says that it?s a great guitar, and I believe him. The red Burny RSA100 - with a sticker with the serial 0212021 - from Ishibashi is believed to be Chinese. Both are called RSA100, both have a headstock without the flower, both have a sticker in the upper f-hole with a serial starting with "021" both sold in the same price range ( The Red one = 47,800 yen. The burst = 59,800 yen). The only thing that seems to be different (from what one can tell in the pics) is the TRC, but such a thing can easily be changed. 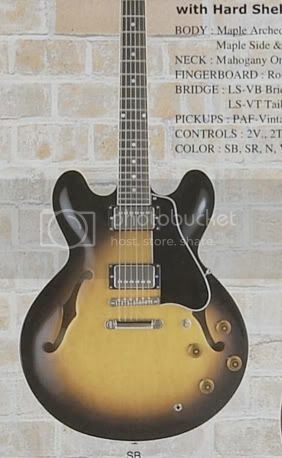 I might buy this guitar (the burst). I just want to be sure of what I?m buying and that the price is right. The same goes for Koubayashi, he want to be sure of what he is selling and that the price corresponds to that. All information about an instrument is vital for both buyer and seller! Have a look to a detail like the burst of a RSA-60/65 model...on the cutaway. It's different on the Tokai model too, so I think Tokai couldn't have made these RSA100. Thirdly, it has typical Tokai routings for the pickups. 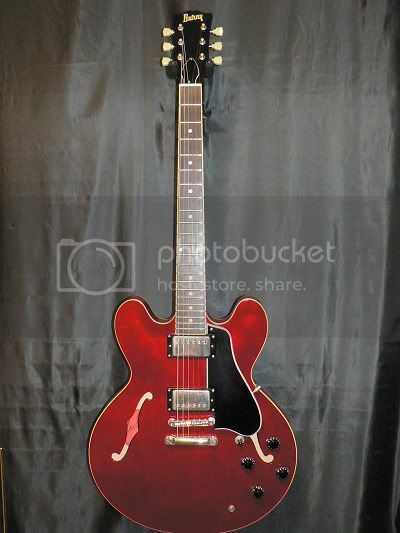 Too bad I haven't got a Tokai to compare it to at the moment. By the way, to compare shape and size from pictures like that doesn't work. Ahhh, I haven't seen that the routing was the Tokai one. So my first idea was the good one. What to look for at the cutaway? Fish the pots and the jack is no problem. Just tie them to threads and pull them in to their position. I have done it on tonnes of semis. however, it never gets as well and neat done as from factory cause they mount everything before they glue on the top (perhaps it vary from maker to make but I don't think so). I will buy a Tokai tomorrow so I have one to compare with. Looks to me like the Burny's F holes are bound - nice touch. And my Burny does not have binding in the F-holes, just like the Tokai. I just pointed out another detail it has in common with Tokai. I think that red one is Tokai made aswell. It has a pointy truss rod cover similar to a chinese made but it is held on with 2 screws. 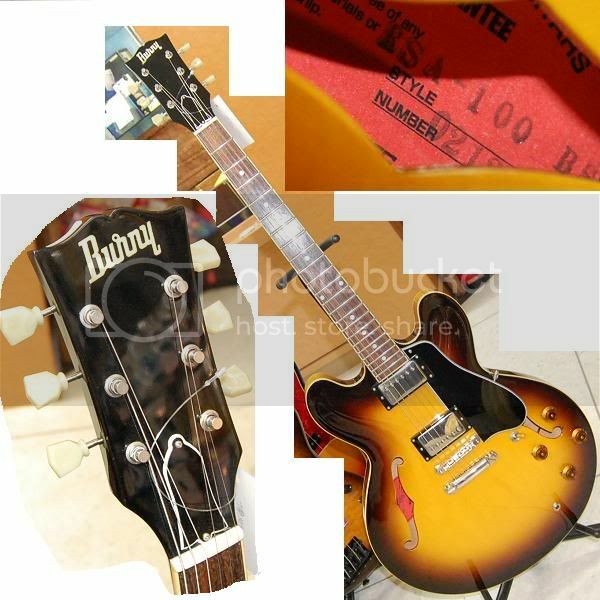 My 2003 Burnyt RLG-90 had the same truss rod cover and it's made by Tokai too.